If a much-discussed showdown with Kell Brook is to be the third and final fight of Amir Khan’s contract with Matchroom Boxing and Sky Sports, Khan is sending mixed messages. The British star says he wants to stay busy and Brook is “the name I want.” He also is adamant about the Brook bout being contested at the welterweight limit of 147 pounds and feels it should take place at a stadium in England sometime during the summer. Brook moved up to 154 pounds earlier this year and has repeatedly stated that he can no longer make the welterweight limit of 147 pounds. Bolton’s Khan (32-4, 20 KOs) and Sheffield’s Brook (37-2, 26 KOs) also have upcoming fights scheduled, which means they wouldn’t fight until next summer if Khan-Brook were to take place during one of those months. Khan’s next fight was officially announced Thursday. The former 140-pound champion is scheduled to meet Colombia’s Samuel Vargas (29-3-2, 14 KOs) on September 8 in Birmingham, England. Sheffield’s Brook is set to face Canada’s Brandon Cook (20-1, 13 KOs) on July 28 at O2 Arena in London. Canelo Alvarez knocked Khan unconscious in Khan’s only fight near the junior middleweight limit of 154 pounds. That May 2016 bout technically was a middleweight championship match, but the contracted weight limit was 155 pounds, not the middleweight maximum of 160. While it’s obviously possible Brook and Khan could agree to a catch weight between 147 and 154 pounds, Khan seems reluctant to afford Brook any potential advantages. “There’s no point mentioning my name and running around saying, ‘I’m scared,’ ” Khan said. “I’m not scared of anyone. I’ve always fought who they put in front of me and never ducked a fight. I’m the one who made this fight closer. I made a deal with Eddie [Hearn] and Matchroom, hopefully, to get this one done. 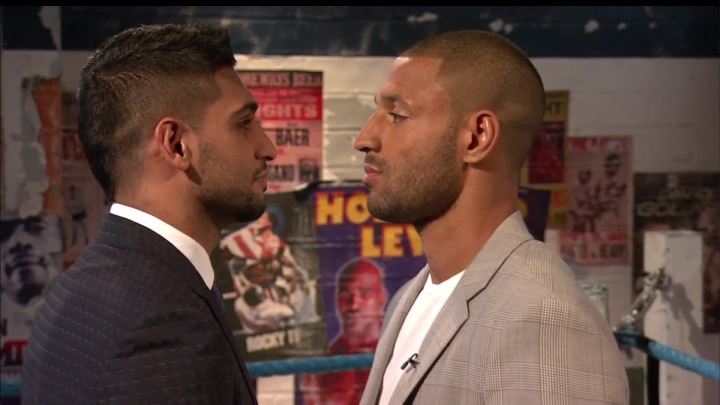 Khan has waited for this moment when he knew Brook would out grow the weight class! Brook will struggle greatly to go back to 147, giving Khan a significant advantage! Please quit Khan, you're a glass jawed bum. You've never wanted to fight Brook, I doubt you ever will. You know you will get Ko'd. Broner, Pacquiao, or Mattyste are options. Doubtful you can win those fights. i knew it. once he got that 34 second falldown, he was gonna constantly be all over the press. sadly, i was right. and i apologize.